Super sweet and highly recommended from kids of all ages, these oreo cookie cupcakes have double dose of cookies in both the cupcakes and the frosting! 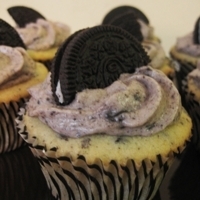 A vanilla cupcake mixed with oreo cookie crumbs and a sweet old-fashioned frosting with oreo cookie crumbs mixed into it. Preheat the oven to 325Â°F. Line 24 muffin tin cups with paper cupcake liners. Sift both flours together in a medium bowl and mix it together, set aside. In a small bowl add vanilla to milk and set aside. In a large bowl, using an electric mixer on medium speed, beat butter until creamy. Then, gradually add sugar and beat until fluffy for 3 minutes. Add the eggs, one at a time, beating well after each addition. Add the dry ingredients in three parts, alternating with milk-vanilla mixture. With each addition, beat just until incorporated â do not overbeat. Make sure to scrape down sides of bowl as necessary. Fold in a third of the Oreo cookie crumbs, then fold in the rest. Fill each liner to just over 1/2 full. Bake until tops feel firm and toothpick inserted in the center comes out clean or with a few dry crumbs, about 20-22 minutes. The tops should remain pale or barely brown just on the edges. Cool the cupcakes. To Make The Icing: Place the butter in a large bowl. Add milk, vanilla, and 4 cups of confectioners' sugar. On medium speed, mix for 3 â 5 minutes, until creamy and smooth. Mix in Oreo cookie crumbs. Gradually add more sugar to desired consistency and sweetness. Icing can be stored in an airtight container at room temperature for 3 days. This is a treat worth the calories! These muffins are fun to make and a real crowd pleaser. Our cousin Kay brought these last night for dessert after Xmas dinner and they were delicious! Thanks for sharing them! Looks so yammy. I am gonna bake tomorrow with my daughter! I sampled one of those cupcakes and even before I frosted them and they were absolutely delicious. Now after I frost them WOW is all I can say. Thank you! to make this recipe helped me for my final grade. I like to bake too and muffins or cup cakes are one of the favorites of kiddies that i do. This would be another hit with the nephews, i can already feel it. This looks pretty simple to make and who doesnt love oreo cookies?